Barolo is one of the most beautiful wine regions in the world. Most tourists visit the Tuscany wine growing region, and think of Tuscany as THE Italian wine growing region, but in my opinion, the best wines produced in Italy are produced in the Barolo region. Barolo wines are expertly crafted wines in the Burgundy style of wine production. These wines have virtually an unlimited aging potential. I found it to be very easy to ship your wine purchases home from this region, so plan a trip to Barolo and fill your wine cellar with wines that will only get better with age. 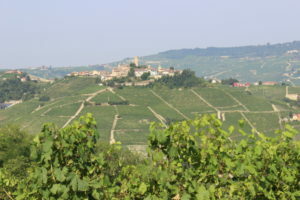 Barolo is a relatively small area to cover. There are two beautiful small towns to visit, La Morra and Barolo. 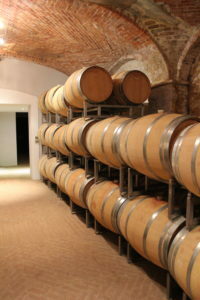 Most wineries in the Barolo region welcome visitors to tour their winery and have a tasting of their wines. There are also many fabulous restaurants in the area, so you certainly won’t be hungry when visiting this area! Honestly, besides eating delicious food and drinking amazing wine, there really is nothing else to do there, but if you are a wine lover like I am, you will have no problem filling many days with winery tours, wonderful lunches visiting more wineries and enjoying fabulous dinners! 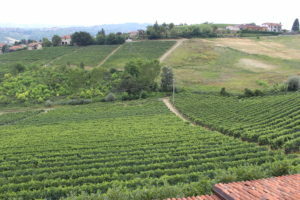 The Barolo wine region is two hour drive from the Milan’s Malpensa Airport. Renting a car and driving to this region is the best way to get there, as it is very rural and has no public transportation to this area. It is a beautiful and easy drive from Milan to Barolo. Rivetto-Az. Agr. Rivetto dal 1902 s.s Serralunga d’Alba Cantine in Loc. Lirano 2 Sinio Piemonte, Italia www.rivetto.it Very nice boutique winery with excellent wines. They do ship wine. If you buy enough wine you can negotiate no cost for the tasting. One interesting thing here to see is they have a cellar where you can actually see the layers in the soil. Something interesting to see, that I had never seen before. Rivetto also has guest rooms that you can stay in. Rita works at the Rivetto winery and gives tours at the winery. Rita is also a local artist that paints with wine. She also makes wine themed jewelry available for purchase out of her studio in Barolo. Contact Rita if you would like to see some of her unique art or some of her fabulous jewelry pieces. Ceretto-Aziende Vitivinicole S.r.l. Strada Provinciale Alba/Barolo Localita San Cassiano, 34 12051 Alba (CN) ceretto@ceretto.com www.ceretto.com I rarely recommend big wineries, but I highly recommend a visit to this winery. The tour at Ceretto was extremely educational. This is an organic and biodynamic winery, and they can educate you on what these terms mean in the region of Barolo. I recommend the higher tier wine tasting. They ship wine which makes purchasing their wines very easy. This is an absolutely beautiful facility. Everyone that worked in the gift shop was extremely nice and they threw in a few bonuses for us because we purchased a large amount of wine. I highly recommend a visit to Ceretto. Marchesi Di Barolo-Via Alba, 12 12060 Barolo (CN) www.marchesibarolo.com reception@marchesibarolo.com This winery is actually very historically important in this region. They offer an excellent tour of their winery which is located in a beautiful old historic building. This winery offers a fabulous lunch in a beautiful dining room, if you book it in advance. No outdoor seating. I highly recommend a tour and tasting at this winery. Fratelli Serio & Batista Borgogno-Via Crosia 12, Localita Cannubi 12060 Barolo (CN) info@borgognoseriobattista.it www.borgognoseriobattista.it No Tour available. Tasting only in a very basic tasting room, Lovely family member who gives the tasting. They ship wine to the United States. Due to the lack of a tour, I don’t recommend this as a must visit. Elvio Cogno-Localita Ravera 2 12060 Novello (CN) elviocogno@elviocogno.com This winery provided a nice tour and tasting at a small boutique winery. By appointment only. The will charge you for a tasting even if you purchase wine. The do not ship wine. Currently they are building a new tasting room. I honestly can’t recommend this winery as a must visit because of their policies of charging you for a tasting no matter how much wine you purchase and the policy of not assisting customers in shipping their wine. I see this as a winery that travelers have no reason to visit. La Vite Turchese-Via Alba 5, 12060 Barolo info@Laviteturchese.com www.laviteturchese.com (Stefano Moiso) This is the best wine bar I have ever been to. This is also an excellent wine store. Small plates of meat and cheese are available. Stefano and his staff are extremely helpful and willing to educate you on the local wines of Barolo. If you want to have a class with him you should make an appointment to meet with him. Stefano will ship your wine for you. You do not need an appointment if you just want to stop in a drink wine or have meat and cheese plates, but if you want him to spend time with you, it is definitely best to make an appointment. I did not actually stay here myself, but this castle and it’s proprietor, Denise Pardini, who is from San Fransisco, have been highly recommended to me. She will make you dinner for as many nights that you wish to dine in house while you are a guest of her hotel. Of course, you might be torn if you should dine in with her, and miss out on some of the fabulous local restaurants…but I’ve heard that her meals are fabulous. Also her website has a lot of good information on restaurants and wineries in the area. If you read her reviews on Tripadvisor you will want to stay here! La Notte Apartment-Fraz. Annunziata, 25/C 12064 La Morra (CN) info@lanottebb.it www.lanottebb.it This is apartment is also available on Air BNB. This is an absolutely fabulous place to stay! The view from the terrace is breathtaking. 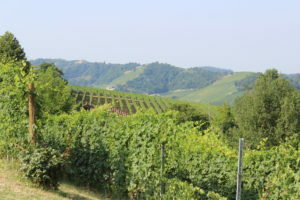 Literally, you can stand outside and have a panoramic view of the Barolo region. Inside, there is a nice kitchen, coffee maker and coffee provided, a beautiful modern bathroom, a nice dark bedroom, which allowed me to sleep in a few mornings, a dining area and two sitting areas to relax in. All in all, just perfection. The owner of the property, Chiara, lives downstairs and with her husband and children, and you will never even know they are there. This is a very well built home, literally you hear no noise from the family downstairs. I was a little concerned about staying on the property with the owner on the property, as I had a very bad experience with a situation like that in the past, but don’t fear this Air BNB, you’ll never even know the family is there. Locanda in Cannubi-Via Crosia 14 | Loc. Cannubi, 12060 Barolo You must not miss this restaurant! You will dine among the vines. Some of the best vines vines in the area are in Cannubi, and this beautiful restaurant with a huge outdoor terrace is right across the street from those beautiful vines. Please dress up for this restaurant. It is a little pricier and fancy than some of the other local restaurants, but totally worth it! Cantina Communale Di La Morra-Via C. Alberto, 2 12064 La Morra (CN) www,cantinalamorra.com info@cantinalamorra.com This is the most cost effective place to buy wines that are produced in this region. I found the same wines in wine stores in Barolo for a much higher price. Hint: If you are a fan of Silvia Altare’s wines, like I am, I found her wines here at the best price anywhere. 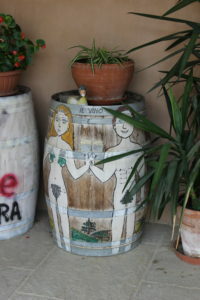 She does not sell her wines from the winery, so if you want any of her wines, this should be somewhere that you stop! They ship wine if you purchase it from them or you can bring wine from local wineries to them and they will ship them for you! They offer wines to taste. The staff is very helpful in helping you find wine that suits your specific tastes and price points. La Fontanazza-Strada Fontanazza, 4, 12064, La Morra This is a tiny restaurant that makes amazing fresh pastas, homemade soups, desserts. Fabulous food. Great view of La Morra. Bring your camera!La Fontanazza-This is a small local restaurant with an outdoor deck and a beautiful view of the hill top town of La Morra. The serve fabulous home cooked food, that you cannot miss while in this area. Bovio-Via Alba 17, 12064, La Morra I unfortunately did not make it to this restaurant, but I have heard very good things about this restaurant. They also have rooms that you can book to stay in. This restaurant is located just outside of La Morra. 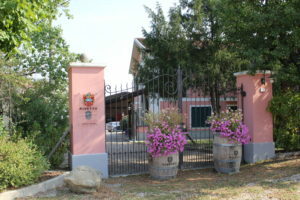 Elio Altare-Azienda Agricola Elio Altare Fraz. Annunziata, 51 12064 La Morra (CN) elioaltare@elioaltare.com This is one of the most famous wineries of Barolo. Altare is a small, beautiful boutique winery now run by Elio Altare’s daughter, Silvia. 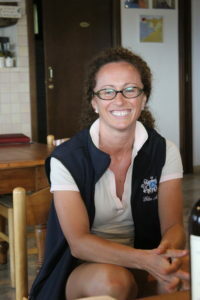 Silvia has appeared in the movies, “Somm: Into the Bottle” and “The Barolo Boys”. In both movies Silvia tells the story of her father, who as a young man in his twenties, drove to France and met with some of the biggest names in French wine, and learned techniques that he took back home with him and applied to his family’s winery, transforming Barolo from a low quality, cheap, hard to drink table wine, into one of the best wines in the world. Silvia is a part of one of the pioneering Barolo families, and yet she is fun, kind and takes enormous amounts of her time to give a wonderful tour of her families estate. I highly suggest you try to get an appointment with Silvia. If you are lucky enough to meet her and tour her winery, it will be one of the most fun and informative tours that you will find in Barolo. Silvia sells out of her wine every year, so you may have to go to the Communale in La Morra or look at wine stores in Barolo to find her wine. Alba is a nice town, with many services available, but it is not picturesesque like the towns of Barolo and LaMorra. There are many wine bars in this town, but honestly, there’s really no need to visit there. Ristorante Larossa-Via Don Giacomo Alberione 10 www.ristorantelarossa.it info. @ristorantelarossa.it If you look on TripAdvisor this restaurant has all very good reviews…all but mine. This restaurant is supposedly very gourmet, and therefore; this restaurant is very expensive. Even though I made my reservation months in advance, we were seated in the back of the basement. It was ridiculously hot in the restaurant, to the point where I became nauseous and could not even eat my dinner. They do supposedly provide excellent service, but I fanned myself the entire evening, and even though the staff could see that I was uncomfortable, they did not do anything about the heat and did not apologize for the uncomfortable temperatures. When I walked out the door to a beautiful, cool evening, it was then that I realized I’d wasted an evening of my vacation in a hot, ugly basement, when I could have spent my evening dining outdoors with a beautiful view, while spending a lot less money. Every dinner of my vacation is precious to me, and it is for that reason that I cannot recommend this restaurant. If you like “Michelin Star” type dining and don’t mind sitting in a basement room to eat, you will like this place. I however, did not enjoy my evening at all. I cannot recommend this restaurant. Ape Wine Bar-(Not Ape! “Ape” means Bee in Italian!) Beautiful wine bar and restaurant next to the church in Alba. We didn’t eat, only drank sparkling water and wine, but people dining around us looked to have delicious food. I wished I’d chosen this restaurant instead of Ristorante Larossa.